In the age of traction control, cornering ABS, electronic suspension, fuel maps and monocoque frames, this GSX-R1100 koncept is old skool cool. 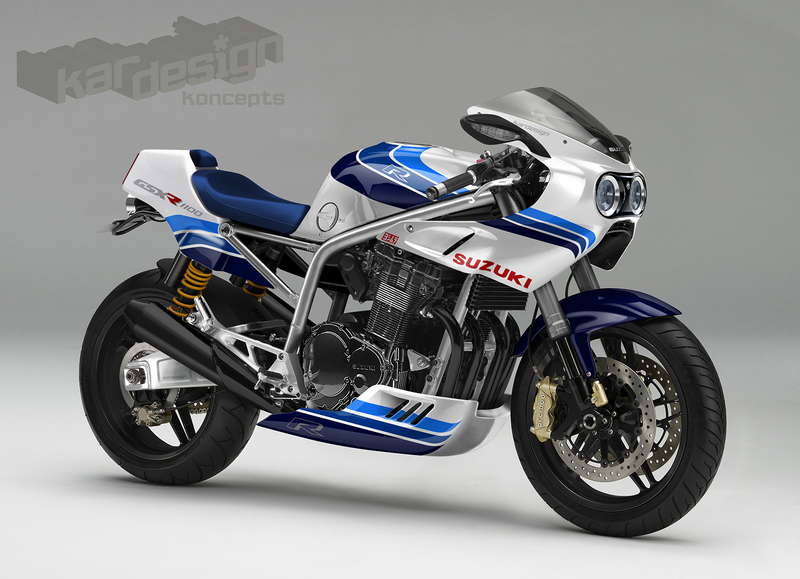 The year is 2007 and Honda have unveiled their retro-themed sportsbike CB1100R as a concept in tribute to the 1981 limited edition machine. A decade later and although the bike never made it into production, public interest has remained high enough for the rumour mill to suggest Honda are actually contemplating building it. If that’s the case then I’d love to see a similar performance retro from other marques. How does a 30th anniversary air/oil-cooled GSX-R1100 grab you? The original 1986 motor made 125 real-world horses through its unique oil and air-cooled 16-valve motor. With no radiator and lessons learned from the lightweight 750 launched the previous year, the 1074cc engine turned out to be more reliable with a little more bhp but a much healthier 80 ft-lbs of torque. Favoured by drag racers, it was easily tuneable too. This koncept uses a next-gen 1157cc Bandit engine and together with fuel injection to replace the 36mm CV carbs we’re well on the way to 150bhp in just five rubber-shredding gears and not a coolant hose in sight. 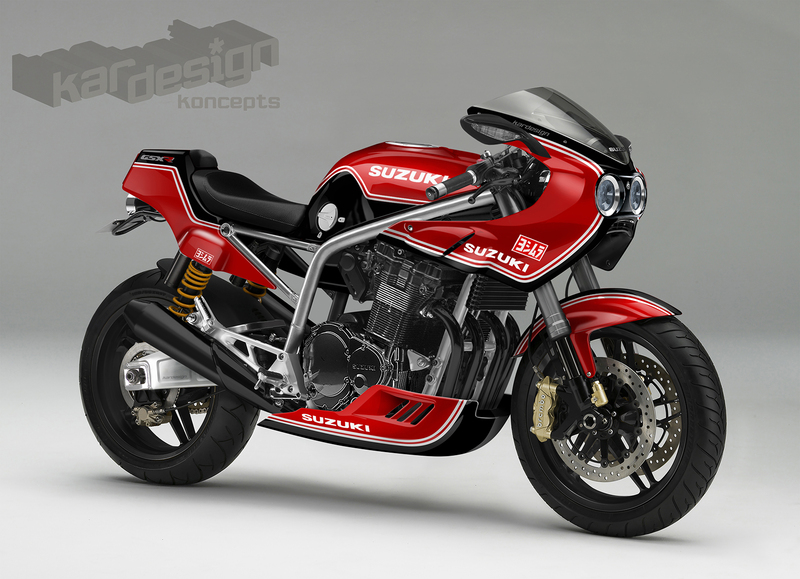 While the 80s GSX-R used a lightweight box-section cradle this concept wears tubular steel – if it’s good enough for Kawasaki’s 200bhp-plus H2…. Modern day concessions involve a move to smaller 17-inch wheels over the skinny 18-inchers, radial braking set-up, stronger swingarm and although there are USD forks at the front the piggyback reservoir twinshocks keep things simple. Perfect for that retro vibe. I’ve included pillion pegs but in the interests of aesthetics and discouraging passengers I’ve ‘accidentally’ left the seat pad at home. Oops. Inspired by the Yoshimura GS1000R endurance bike, just like the Honda CB1100R concept the lower fairing is left off to showcase the cooling fins on the engine block and lack of radiator to spoil the view. The big fuel tank also houses a fuel tap that has shades of Katana for those hilarious sticky-out leg moments when it starts to splutter in the fast lane of the motorway. Twin round LED headlights are the perfect fusion of old and new, lightweight yet powerful, much like this GSX-R.